Amy Steffian | Alutiiq Museum Apr 23, 2018. Kate Schaberg. Photograph courtesy the Alutiiq Museum. 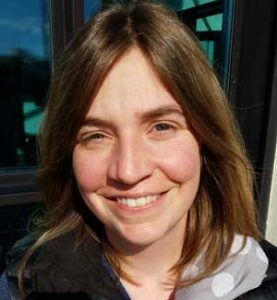 The Alutiiq Museum has hired Kate Schaberg as its Special Projects Coordinator. Schaberg will manage the development of the Alutiiq Ancestors Memorial, the museum’s collaboration with the City of Kodiak to build a new public park in downtown Kodiak. Schaberg, who assumes responsibilities formerly held by Jeff Garcie, began working at the museum last week. She is currently helping the museum complete the project fundraising campaign and will oversee park construction in the coming months. Schaberg, who grew up on a farm in Pennsylvania, holds a bachelor’s degree in biology from Pennsylvania State University. She has lived in Kodiak for more than three years with her husband, Kevin Schaberg, and their two children. In addition to her half time position at the Alutiiq Museum, Schaberg works as the local 4-H Program Assistant. Schaberg has previous experience working with tribal communities in Western Alaska. For more than six years, she managed projects for the Georgetown Tribal Council as Environmental Coordinator. “One of my favorite projects was developing an archive of traditional ecological knowledge in the Middle Kuskokwim Region. I am honored to play a part in the sharing and preservation of Alutiiq culture in Kodiak,” said Schaberg.Beyond work, Schaberg enjoys spending time outdoors gardening, hiking, or beach combing with her family. She is also an avid crafter who takes photographs, weaves, and quilts. The Alutiiq Museum is a non-profit organization dedicated to preserving and sharing the history and culture of the Alutiiq, an Alaska Native tribal people. Representatives of Kodiak Alutiiq organizations govern the museum with funding from charitable contributions, memberships, grants, contracts, and sales.